Through the lightning 4 in 1 Audio Camera Connection Kit ,it's incredibly easy to download photos from your digital camera to your iPad. It gives you two ways to import photos and videos.One is ti use USB cable ,the other is to read form SD/Micro SD card directly. The Connection Kit supports standard photo formats,such as JPEG and RAW etc. Besides,it supports PC keyboard input as well as imports photos form USB flash disk to iPhone/iPad/iPod Touch. You can connect more USB accessories like hubs,keyboards,audio/MIDI interfaces,ethernet adapters,card readers of SD and Micro SD and more. Moreover,it allows you to charge iPhone/iPad/iPod Touch.via a micro USB cable. 1.Connect to iPhone/iPad/iPod Touch data port directly.No need app installation. 2.It supports a micro USB cable to charge iPhone/iPad/iPod Touch. 1.The lightning 4 in 1 Camera Connection Kit has 4 ports.However,USB port,SD port and Micro SD port can't be used at the same time. The Lightning port can be used together with any of above 3 ports.For example,you can charge iPhone/iPad/iPod Touch and put keyboard type at the same time. 2.If USB flash disk/Micro SD card/SD card directly use with this kit,you must create "DCIM" folder. The upgraded iPhone OTG adapter compatibles with iOS 9.3 or later compatibility Version,compatible with the latest iOS 11.3. Easy to use, plug and play, NO APP NEEDED. 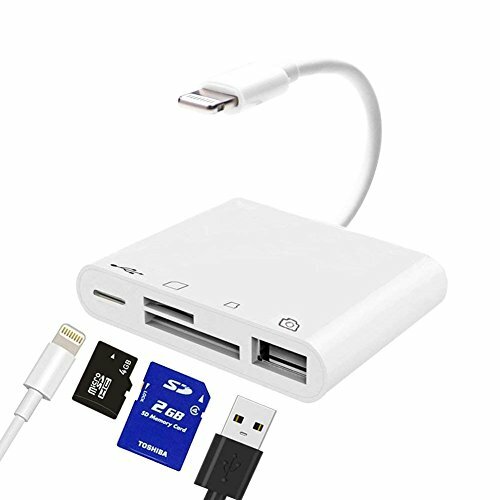 We add an Lightning charging port to make it more powerful,with an usb power adapter,You can connect more USB accessories like hubs,keyboards,audio/MIDI interfaces,RJ45 Ethernet LAN Wired Network Adapter,card readers of SD and Micro SD and more. Transmission is 14MB/S~16MB/S, Faster transfer of photos and videos between two iOS devices at USB 2.0 speed,support maximum 64Gb SD/TF card. A great choice for copying photos or videos to camera in a short period of time. Connect the lightning USB 3.0 adapter to the keyboard to enjoy the faster typing speed as a computer when chatting or typing with your iPhone or iPad, and can charge your iPhone at the same time! Please Note: 1. This adapter does not support USB devices over 100mA current. 2. SD/TF card reader and USB interface cannot be used at the same time. 3.It is "One-Way-Transfer". If you have any questions about this product by Cisharua, contact us by completing and submitting the form below. If you are looking for a specif part number, please include it with your message.